In my life, I've only flew (on plane) 3 times. My trip to Bangkok would be my fourth and hell it was the scariest ride of my life. At one point I almost believe I'm going to die as the plane rumble, shaking violently in the air. Air stewardess ran to grab food falling down the cabinets. The light for fastening your seat belts went DING DING. I remember the movie "ALIVE" playing in my mind. Never watch this movie please or you'll be terrified of air planes. I swear I won't sit air planes anymore..
Jamie has never been on a plane and figures if man was suposed to be high up in the air gravity would never have been! but since what goes up must come down I don't blame you for a fear of heights I join you with that same fear! you are lucky that you did not face sudden drop in altitude. 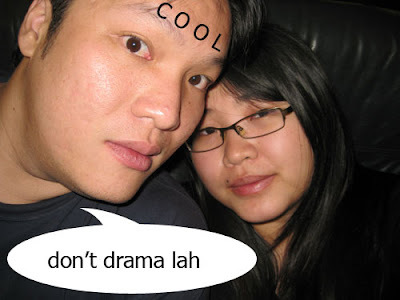 my colleague kena once. you know, like free falling? that's why it is ALWAYS to your advantage to be wearing safety belt while flying, otherwise, you might break something if free falling as you would hit the ceiling - like the 1st episode of LOST. anyway, que sera sera. what will be will be. heard of the story of a man who was predicted to die in a plane crash? he laughed it off because he says, no way that is going to happen because he can't afford to sit in plane. one day, in toilet, a plane crash into his house and he dieded. go figure..
uncle: so u saying if it's fated it will happen so dun worry?! btw the plane did drop a little.. n there's where i lost my heart. Lucky is not so bad like ur fren, i could die on the spot. 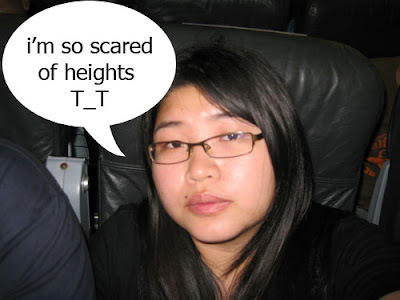 aiyo sitting beside her scared me more then the plane in turbulence. She nearly rip out my hand in the plane. Hi Miu, its me Hali, one of the kaki warehouse sales. Just manage to go through your blog page. hmm kesian you, such a bad experience in the flight huh.. I am frequent traveller, usually short distance flight always had that kind of interference, sudden drop, tumbling and etc. I hate it each time i have to go through it.. i used to fly to Cambodia for business meeting, the flight is also lasted 2 hours, and it shake like no one business, at once after a few sudden drop, I thought I am gonna die.. really terrified! so to minimal the risk, i used to sit at the back of the plane, the chance of survival is high hehhehe.. hey those expert say so..
hi hali! shoppin kaki hehe!!! Auntie A: "eh no more go to UK ah?" Auntie B: "duwan sit anymore lah!! scare lah!! the last time i sit to XXXX the plane went thru turbulence and everyone was screaming. My partner grab her front seat, and the next one grabbing the chair below, I realli tot i am goin to die!! then i remembered back my experience..oh it's really frightening.. short distance like that? :( looks like i apply insurance b4 i sit planes again. Hi Miu, I'm Nic. shopping maniac and a cat maniac. well, your flight is better than mine coz for once I need to take a flight (alone) to NZ to see my husband. I couldn't remember how long was the flight from S'pore to Auckland, but what I can remember was I took 3 meals but didn't even go to toilet for once, I even didn't stand up. I dare not to know the time, didn't turn my head to left coz there was a guai-lou keep smiling and wants to chat, (sorry, I'm a bit anti social....to stranger) I slept most of the time, luckily the guy who sits at my right hand side was a small size. he too like me sleeps... the both of us changed so many post while sleepig. 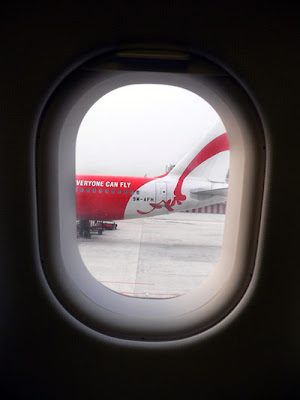 well, I hate to fly coz everytime I ask for seat far from the wing but every time I got the exactly seat on the wing. the wing part is so bore and noisy and nothing to see. so remember next time when you book a flight ticket same like ordering KFC, no wing no drumstick!! hehe.. I love chicken breast.